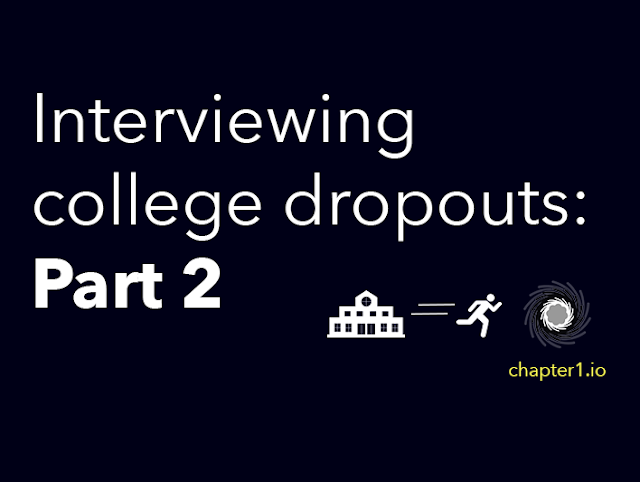 This the second segment of the drop out series where I asked a questions to individuals who have dropped out of higher education to pursue their passion full time. The next couple people have already answered last year so it's out of date, but I will be interview more as I obtain further interest. These individuals had the opportunity to remain anonymous so if you don't see a name, you'll know why! Thank you so much Jeroen for interviewing with Chapter1.io! Let's begin. About me... I'm 25 years old, I've attended 6 colleges (still attending one, contemplating dropping out again), only received an Associates Degree in Computer Science, been to 47 hackathons, inspired 100+ kids ranging from 10 years old to my grandpa to try out new technology and create something new. I'm currently a web developer doing mostly dev ops at ResQSoft, Inc. They were the only ones who didn't really look at a degree because I had worked with one of the team members (now my boss) before on a project. The team doesn't value a degree as much as it does work ethic and results. I've been working with them for a little over a year now and I'm loving it. On the side, together with Luis Villavicencio, I run HackWare, a project by Hacker Fund. HackWare is a charity with a focus on providing new technologies to individuals who have never had a chance to experiment with them. We provide the hardware, teach workshops, mentor anyone who needs it, and promote creativity and team work. My role at HackWare is to be the lead public figure. I represent the charity as it's the result from the second hackathon I ever attended. I spent an entire year going to classes, taking tests, and completing projects without ever learning anything new that would end up helping me in the field. I dropped out because GMU forced me out of the CS department. My family kind of saw it coming and my friends all supported me, claiming I'll land on my feet. My parents continuously keep telling me I need to get a degree just in case something goes bad. I have pretty much always taken their advice and then done whatever I thought was right. Their advice and my decisions rarely align. I'm a web developer at ResQSoft doing mostly DevOps (maintaining servers, running tests, setting up pipelines and deployments), and I'm the CEO/founder of HackWare, traveling the country with boxes of hardware and teaching workshops. I would have dropped out sooner. Or at least drop out with a good GPA. Even companies that claim they don't care about you having a degree will still judge your transcript - I speak of experience. I am back at ODU, taking 1 online class per semester. At this pace it'll take a while but I'll be able to complete my education on my own terms. 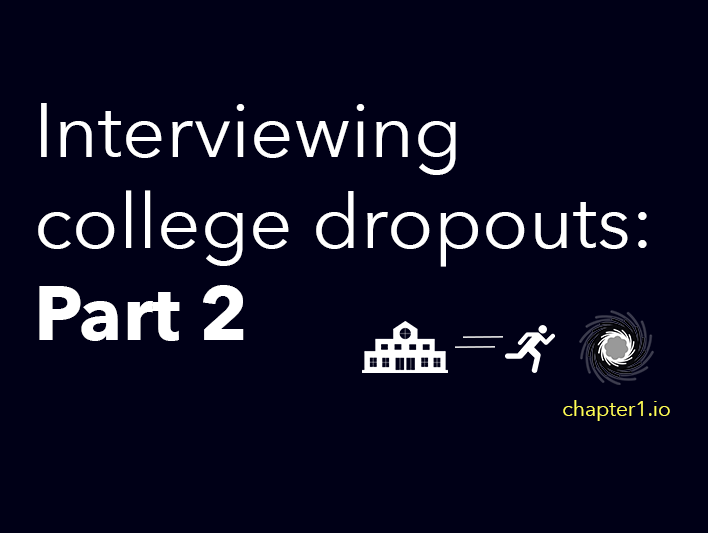 Try your hardest to stick through college. If it REALLY doesn't work out, don't just decide to drop out without having talked to someone who's been there. There are more things that come in to play than just you not going to school. You're going to need to get a job. You're going to have to find a place to live. You're going to have to start your life as a responsible adult. And everywhere along the way, people will look down on you because you're taking the road most don't dare follow. If you're going to go for it, plan accordingly. Talk to your parents, to friends, to colleagues, to recruiters - yes, recruiters. They can get you a job!!! And when you do drop out, don't let that decision linger. Be confident about it and move on. There's nothing you can do about it now, you're going to have to make the best of it.